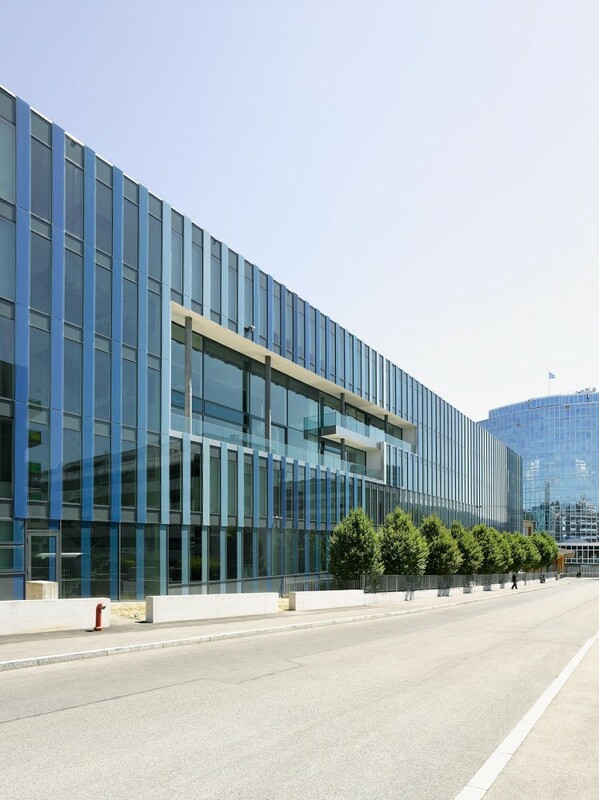 The new administration building for the World Intellectual Property Organization, WIPO, is located in Geneva’s international district, immediately adjacent to the European Headquarters Building of the United Nations, the Nation’s Plaza and the existing WIPO Headquarters Building. The site is located close to the lakeshore and is surrounded by mature trees, established gardens and small-scale residential buildings. Housing about 500 workspaces in a highly flexible layout, cellular offices are gathered around three generous glass-roofed atria and alongside the external facades. Common areas such as the double-height internal gardens and atria stairs enrich the circulation system. Together with the informal meeting areas distributed on the office levels, these common areas play an important role in promoting communication and interaction among employees. A cafeteria with a 300-seat restaurant area is located on ground floor. The WIPO library sits on the first floor, easily accessible from the reception area. The lower levels of the building include a delivery yard, underground parking for WIPO staff, space for storing archives, technical plants and other service areas. The ground floor also houses meeting facilities with interpreter booths. 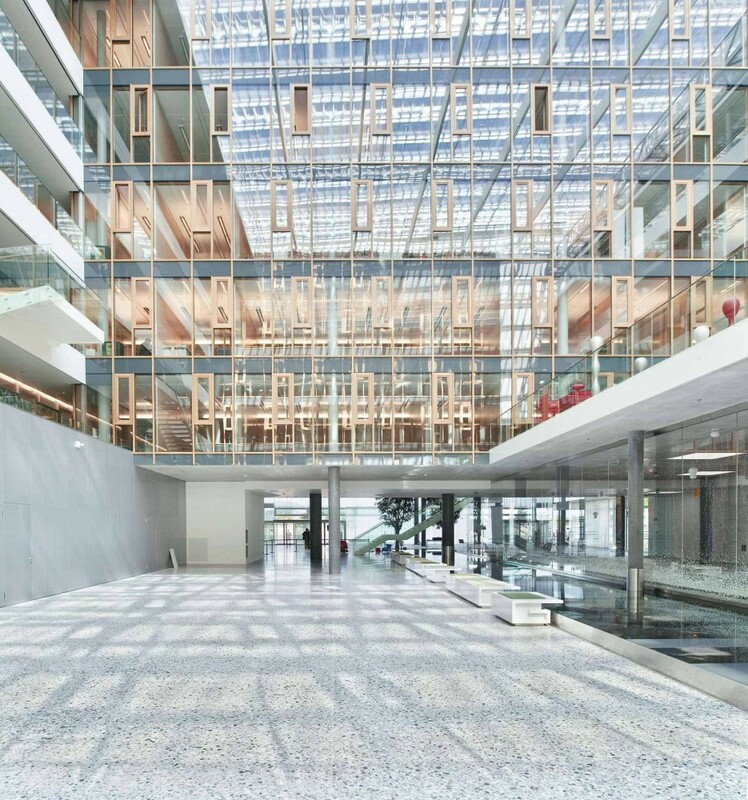 A spacious hallway on the first basement level with illuminated mirror-walls and glazed skylights will connect the new administration building with the existing WIPO building complex. Five basement levels for additional parking have been built between the new building and the main WIPO building. 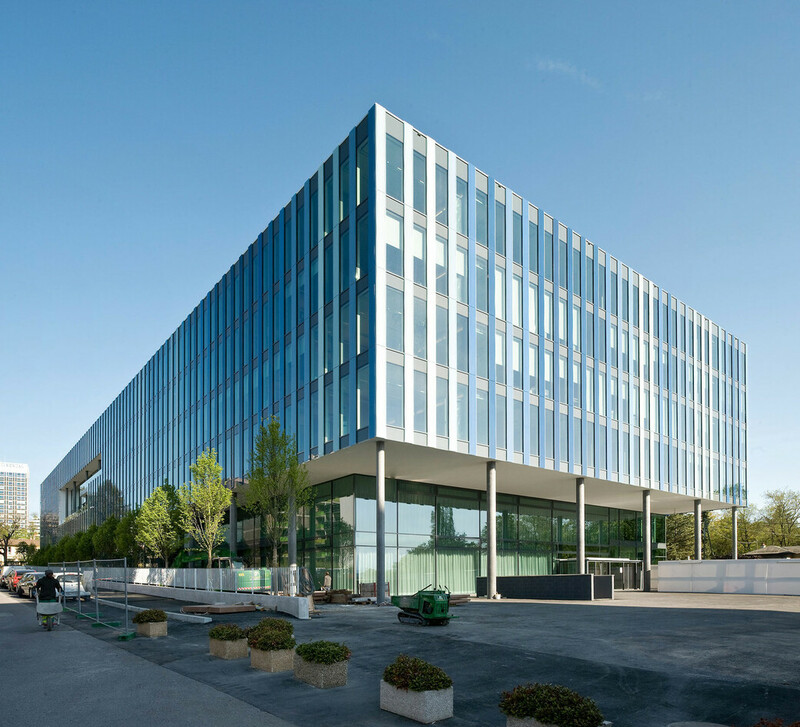 The new building employs a variety of sustainable design principles to reduce its overall energy consumption including the use of Lake Geneva’s water for cooling, the use of thermally activated concrete slabs at the building’s ground floor, the natural extraction of air via the stack-effect, and the optimization of natural light in all offices and ground floor areas. In addition, devices on the glass-roofs redirect daylight and highly insulated glass facades with daylight-optimized blinds naturally control heat and glare. 47.140 qm / 507,411 sq.ft. 190.253 cbm / 6,718,720 cu.ft.